Bread being integral to the cuisine of Tuscany, ribollita isn’t the only Tuscan soup prepared with bread. 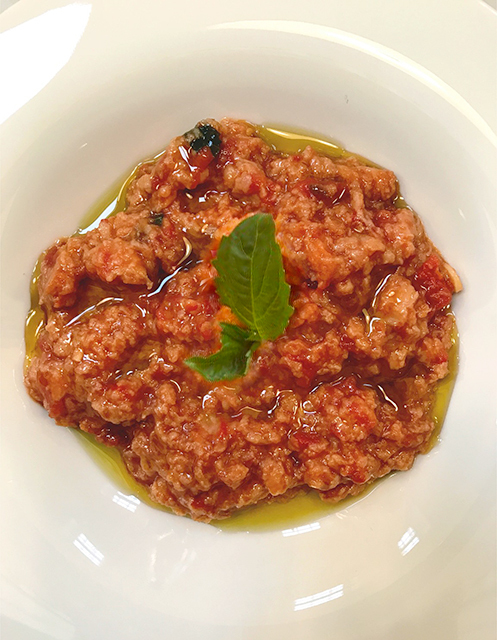 Pappa al pomodoro (pappa means “mush” or “baby food” in Italian) is a rich, thick fusion of tomatoes, basil, olive oil, garlic, bread and broth. It is the perfect summer soup when served at room temperature. I make it often in the summer with different varieties of tomatoes that are at their peak of perfection. You can also serve it hot, I learned one cold, damp winter day in Florence while having lunch in the San Lorenzo market at the Nerbone counter, famous for its rustic fare. While my husband enjoyed a warm panino di lampredotto (the traditional Florentine sandwich filled with the simmered, fourth stomach of a cow), I savored a steaming bowl of pappa al pomodoro. Although it was prepared with preserved or canned tomatoes, it was just as delicious, and comforting, in the winter too. Heat the oil in 4-quart saucepan or casserole over medium heat. Add the garlic, and when it begins to sizzle add the tomatoes with their juice and basil. (Chopped garlic cooks quickly, so it’s essential to keep an eye on it so it doesn’t burn.) Continue cooking about 15 minutes until the tomatoes have cooked down into a thick sauce. Add the bread cubes to the pot and stir well to combine with the tomato sauce. Season with salt and pepperoncino, if you are using it. Add the broth, stir and continue cooking 10 to 15 minutes longer. Cover the pot and allow to rest at room temperature for at least an hour. Serve with a drizzle of olive oil. Or reheat and serve hot, with olive oil.